I'm gonna go ahead and admit that I'm a rookie when it comes to cooking pinapaitan. Or anything with beef bile and innards. But I'm an OG at eating it, as it was a frequent dinner table dish growing up in an Ilocano household. Even more frequently than adobo or sinigang. Pinapaitan even passed the Ingredient Revelation Test: that moment when a Filipino parent reveals to their child what the ingredients in a particular dish really are. Dinuguan isn't "chocolate" but coagulated pork blood. Sisig isn't just grilled meat, it's chopped face and ears. Each shocking reveal made me hesitant to eat revisit some dishes but pinapaitan was different. Beef bile? Tripe? Intestines? NOM. I liked pinapaitan then, but I love it now. There's no other food in the world, or even elsewhere in Filipino cuisine, like it. 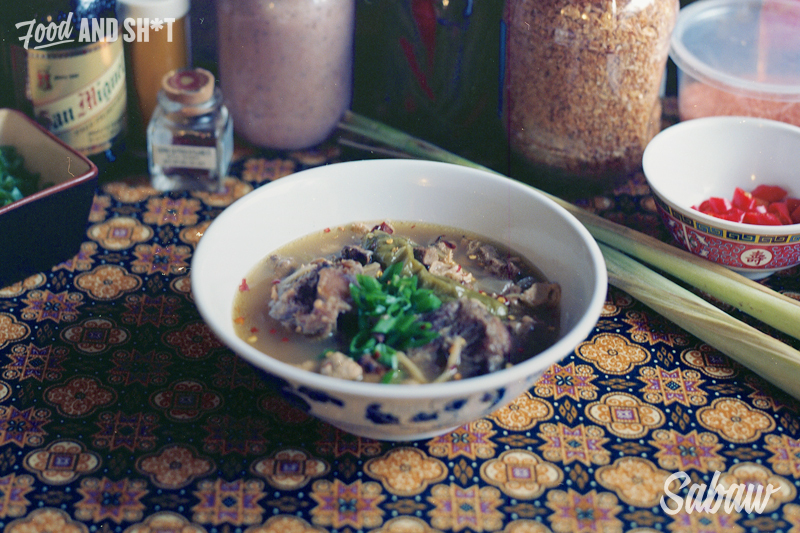 Type "beef bile soup" in your search bar. All you'll find is papaitan, the bitter innard stew that embodies the Ilocano taste for bitterness and sourness. Every time I tried to cook this dish, it was never as good as moms & pops. Their recipe and instructions were just a list of ingredients and cooking times rather than measurements and techniques. Mine never translated into the version they'd been making consistently for three decades. So when we had pinapaitan on the Pulutan pop-up menu, we had moms cook it. Moms has helped prep a handful of dishes in previous pop-up dinners, but this one she prepped and cooked entirely. I paid attention to everything: the way the innards were washed, chopped and soaked in vinegar to neutralize that innard taste. The adding of the bile little by little until precise bitterness is reached but never overdone. Even the way the ginger was cut. Classic pinapaitan is all about the innards, with some liver and a chopped lean meat like brisket. This one has all the ingredients of the classic version I grew up on, but with my favorite cut of beef for stews and soups: oxtail. Also, rather than throwing the beef liver up in there and letting it bully the sabaw flavor with it's liverness, the liver is marinated and pan-fried before joining the party. Pinapaitan is not an entry-level Filipino dish. There's even (gasp) Filipinos out there who can't do pinapaitan. God bless em. More for me. And us.